Summit County, Colorado may be best known as a popular winter destination thanks to its world-class ski resorts, but it also provides a beautiful summer escape for nature lovers. Once the snow melts, outdoor enthusiasts flock to Summit County to indulge in great hiking, biking, and kayaking. Three of the area's major mountain spines host terrific hiking trails, and visitors can spend days exploring the idyllic natural trails scattered throughout Summit County. 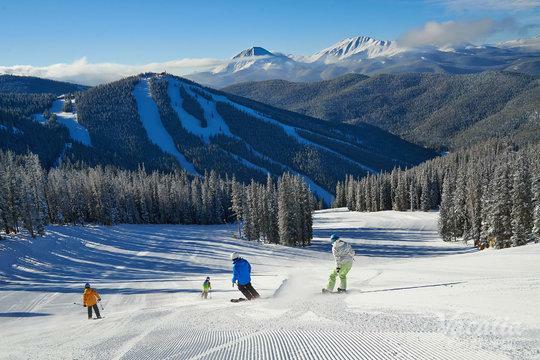 Whether you want to stay in Breckenridge, Copper Mountain, or Keystone, you will be able to find a quality resort near hiking trails when you use Vacatia to book your vacation rental. Vacatia can help you sift through the selection of lodging near Breckenridge hiking trails so that you will find the perfect rental for your upcoming trip to these beautiful Colorado mountains. Whether you are searching or lodging near Keystone hiking trails or for a vacation rental near Copper Mountain hiking trails, Vacatia's easy-to-use search tool can help you narrow down your search so that you find a quality vacation rental in a terrific location. After spending your days exploring the kempt hiking trails throughout Summit County, you will want to return to a comfortable, spacious vacation rental, which is where Vacatia comes in. Vacatia provides travelers with high-quality vacation rentals that offer ample living space, including extra living areas and kitchens, as well as hotel-style amenities. Vacatia proves that you don't have to give up the plush comforts of a hotel to get more usable space in a vacation rental - you can have the best of both worlds when you book one of Vacatia's resort residences. When you stay in a Vacatia vacation rental, you can spend your day exploring the beautiful natural surroundings of Summit County's mountains and return to an ideally located vacation rental. Find your perfect home away from home in these Colorado mountains by booking your vacation rental through Vacatia. Summit County is home to numerous picturesque hikes, all of which are ideal for lovers of the great outdoors. Some of these hikes are easier, while some are more challenging. Regardless of your skill level on the hiking trail, you are sure to find several great hikes that will introduce you to the limitless natural beauty of the Colorado Rockies. Some popular Summit County hikes include Mohawk Lakes, Upper Cataract Lake, Peak 1, and Quandary. There are three-mile hikes as well as 12-mile hikes, so you can spend several days exploring in the gorgeous mountain terrain. If you want to find lodging near Copper Mountain hiking trails or near trails in Breckenridge or Keystone, you should work with Vacatia to find your perfect vacation rental. Vacatia can help you find a spacious, comfortable vacation rental ideally situated close to some of the best hiking trails in Summit County, which means that you can spend less time traveling to the trails and more time actually on the hiking trails during your upcoming Colorado vacation.